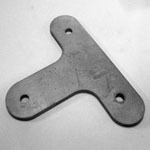 Aluminum Shims - American Metals Co.
American Metals stock many grades of Aluminum material Please click here to send us a request for quote. Grade 1100 is a relatively low strength, essentially pure aluminum ( 99%). It is noted for excellent welding characteristics and formability along with good corrosion resistance. It cannot be hardened by heat treatment. Grade 1145 is similar to Alloy 1100. It offers comparable ease of formability with an increased concentration of aluminum (99.45%). 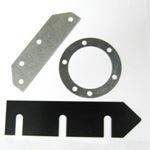 Alloy 2024 has superior strength due to addition of copper and good machinability. Is is widely used in the aerospace industry. Added copper makes 2024 less corrosion resistant. Alloy 3003 is an alloy that has very good corrosion resistance and higher strength than Grade 1100 due to the addition of manganese. Grade 3003 is not heat treatable. Alloy 5052 has excellent corrosion resistance and good formability and weldability. 5052 is not heat treatable. Alloy 6061 is arguably the most widely used aluminum alloy due to the balance between strength, corrosion resistance, and machinability. 6061 is heat treatable. 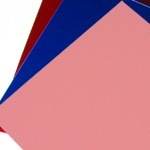 Certain thicknesses of Aluminum shim stock is available in colors to allow users to tell the thickness easily. Thickness of shims made from laminated aluminum shim stock can be adjusted in the field.by peeling off one layer of lamination a time. 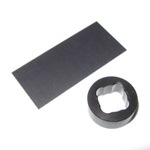 Following description of the aluminum laminated shim stock material is based on AMS-DTL-22499. Other specifications include BOEING BACS40- series, BELL 120- series, LOCKHEED/BOEING 5PTC series, VOUGHT NORTHROP GRUMMAN GS and CVC series.